Manholes, crawl spaces, tunnels, sewers, tanks, pipelines and trenches, all have one thing in common, they are enclosed or partially enclosed and are refer to as confined spaces. These confined spaces are not intended for continuous occupancy, why? If people work in a confined spaces, they could face life-threatening hazards such as toxic substances, electrocutions, explosions and asphyxiation, these could result to serious injury or death. A confined space can be more hazardous than regular workspaces for many reasons, many workers are injured and killed each year while working in confined spaces. To effectively control the risks of accidents with unauthorized confined space entries, the entrance and exit should be restricted. CableSafe’s confined space entry protection barrier or manhole protection barrier is the ideal tool for employees and contractors to secure these dangerous openings. The barrier warns co-workers and public for its dangers and prevents unauthorized (or accidental) entry. “In the construction industry, entering confined spaces is often necessary, but fatalities don’t have to happen,” said Secretary of Labor Thomas E. Perez. At CableSafe, we are concern about your safety and that of the public, as such we have developed products that will ensure utmost safety in any confined space or related worksite. The law requires employers to provide their employees with safe and healthful workplaces, with CablesSafe range of safety products you can avoid penalties that comes with non-compliance to safety standards and legislations. This a heavy corrugated plastic manhole barriers that fits most standard manhole covers. It has an elastic cords with hooks enabling a very easy installation to the flange of the manhole. 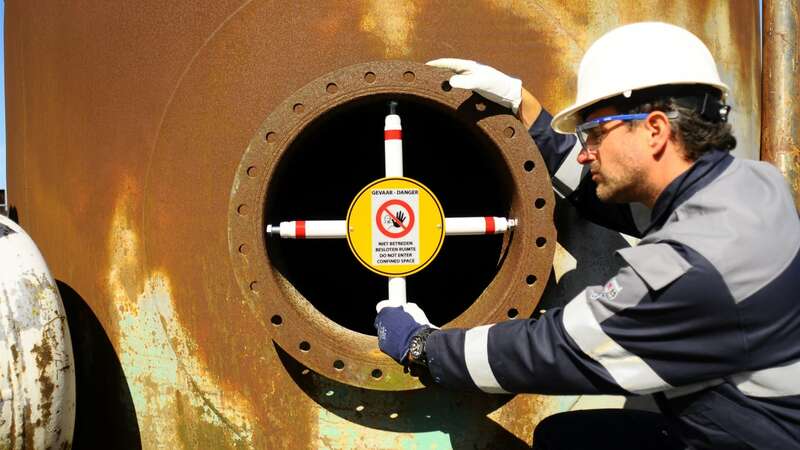 This Manhole protection barrier can withstands extreme conditions and contain a sign or vinyl label with messages warning everyone on the confined space entry danger. Designed as a physical barrier with a sign that hooks easily on the rungs so the warning cannot be missed. This prevent unauthorized entry to manholes, vessels, tanks and vaults. The barrier is durable, has a diameter of 990 mm (appr. 40 inch) and a 4 mm thickness and can withstand impacts, scratches, and other industrial conditions. For easy installation the barriers are equipped with bolts & nuts. Base on specific needs, magnets (95 Newton; 9.5 KG force) and locks can be provided on request for easy handling and/or locking of the confined space protection barrier. Made of robust materials and easy to install. CableSafe’s Manhole entry barriers do not only restrict entry into a confined space, it has been designed with visual cue to alert workers and public to hazard. Our price is extremely reasonable, we offer standard off the shelf safety systems as well as customized solutions to meet your specific jobsite requirements.